We had a beautiful evening yesterday for our annual Thank You Night! What a perfect day! 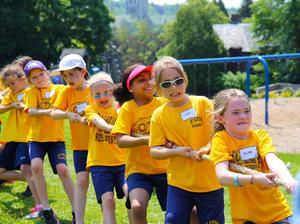 We lucked out this year with the perfect weather for Mount Alvernia Academy’s annual Field Day. 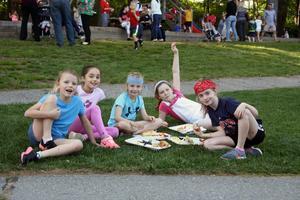 It is a special time of year for Second Graders at Mount Alvernia Academy. The entire class celebrated their special First Communion Liturgy today with their parents and the community present. What a special and beautiful service it was. And the winner is . . . the Arctic Fox! Seussical the Musical was a Smash Hit! Bravo! Encore! What a show! Sometimes things just click; a place feels like home the minute you walk through the door. Every harbor must have a harbor master, and each air traffic control tower must have a chief. At Mount Alvernia Academy, we have a front desk dynamic duo, Mrs. Rita Riordan and Mrs. Kathleen O’Toole. Spring into action and get a head start on your school search! Author David Ira Rottenberg and Dancers from Tony Williams Dance Center Perform "Gwendolyn the Graceful Pig"
What fun! Author David Ira Rottenberg was on campus today reading his wonderful book, "Gwendolyn the Graceful Pig," about a pig who dreams of learning to dance. From her devotion to our students and commitment to simplicity to her immense dislike of talking about herself, Sr. Irene Laurence is a Franciscan through and through.